You are here: Home / μGnews / What is botulism? Botulism: n. German, 1878, derived from Latin botulus, sausage. An illness first associated with eating tainted sausage. 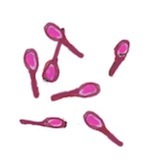 Clostridium botulinum cells appear as tiny tennis rackets, with a single spore swelling one end. How many types of botulism are there? Infant botulism is the commonest form, but even this is very rare. In New Zealand, the most recent cases notified were decades ago, and there have not been any confirmed cases reported during the current alert. In Australia there were only six cases of botulism reported between 1991 and 2003. In the USA 263 cases were recorded between 1990 and 2000 in 160 botulism events. Almost half these cases were from Alaska, all of which were associated with traditional foods. Most cases of botulism are the result of consuming home bottled, canned or preserved foods in which spores of the bacillus, Clostridium botulinum survive initial food preservation then grow in anaerobic conditions to produce a toxin. Cases are usually due to consumption of food contaminated with pre-formed toxin which binds to specific nerve vesicles where it inhibits the release of the chemical signal that activates muscle fibres. This is what causes the loss of muscle function and leads to paralysis of specific muscle groups. In infant botulism, the biology is different because the toxin forms only after ingestion of bacterial spores which germinate in the gut and then release toxin. Honey is a recognised cause of infant botulism, hence recommendations to avoid honey before the age of one year. How can botulism be recognised? In its early stages, infant botulism often starts with constipation, difficulty swallowing and sucking, an altered cry and loss of muscle tone. Advanced infant botulism makes the baby floppy with loss of head control, a flaccid face, difficulty swallowing and other signs of altered nerve function. In adults, botulism is typically a descending paralysis beginning with paralysis of muscles in the face, head and throat including the eyelids. Paralysis then progresses to involve the muscles of the chest and extremities, resulting in a failure to breathe. How can botulism be confirmed? The clinical diagnosis of food-borne botulism can be confirmed by detection of botulinum toxin in serum or gastrointestinal contents. 15-20mL serum and 25-50g faeces are needed from adults. A minimum of 2-3mL serum is needed from infants. These tests are only available in a small number of reference laboratories because of the rarity of the disease. (Culture of Clostridium botulinum from faecal specimens can support a clinical diagnosis, but is not regarded as definitive confirmation in the absence of a positive toxin test).